[ T. J. Wise: Proof of what would be the first volume of his Tennyson bibliography, with Signed Autograph Inscription to W. M. Rossetti. ] A Bibliography of the Writings of Alfred, Lord Tennyson. Alan Bell, in his entry on Wise in the Oxford Dictionary of National Biography, characterizes him as 'both a careless and a dishonest bibliographer' (see also Simon Nowell-Smith, 'T. J. Wise as Bibliographer' in the Library, 1969). One of Wise's aims was clearly to legitimize his forgeries, and as John Collins states in 'The Two Forgers' (1992), his bibliographies are all 'more or less tarred with Wise's own publications'. Autograph Letter Signed ('W C Bennett') from William Cox Bennett to J. T. Baron, boasting that his magazine 'The Lark' is a 'powerful influence'; naming Gladstone, Tennyson and other contributors; and urging the 'Newsvendors' of Blackburn to buy it. On letterhead of Hyde Cottage, 68 Royal Hill, Greenwich, SE. 27 November 1883. 3pp., 12mo. Very good, on lightly-aged paper. In original envelope, with stamp and postmark, addressed by Bennett to 'John T Baron Esq. | 48 Griffin Street | Blackburn | [signed] W C Bennett'. He begins by informing Baron that four numbers of 'The Lark' have already been published. From The Times, Monday 15 November 1852. Original cutting, 53 cm long, from The Times, of an article titled 'Ode on the Death of the Duke of Wellington. By Alfred Tennyson.' This poem, one of Tennyson's finest and best-known, was published on 16 November 1852 (two days before Wellington's funeral) by the London publisher Edward Moxon, who had offered Tennyson £200 for 10,000 copies. As Edgar F. Shannon, Jr.
Autograph Note in the third person from Alfred, Lord Tennyson, to the Lord Chamberlain the Earl of Kenmare, declining an invitation. 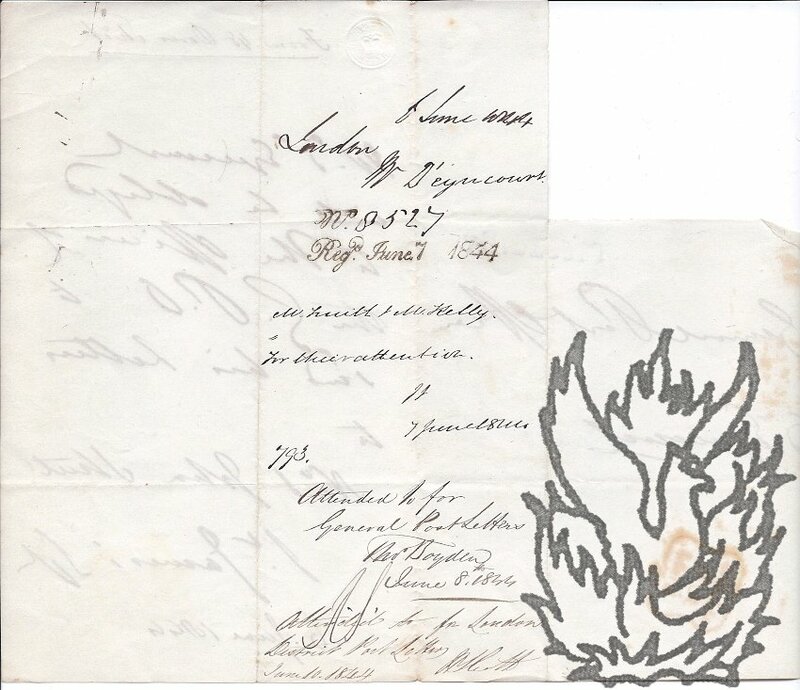 On letterhead of Aldworth, Haslemere, Surrey. May 1885. 3612 Stanton Avenue, Chicago. 21 November 189<2>. 4pp., 12mo. Worn and stained on four leaves with wear to extremities resulting in slight loss of text, and with at least one leaf lacking. 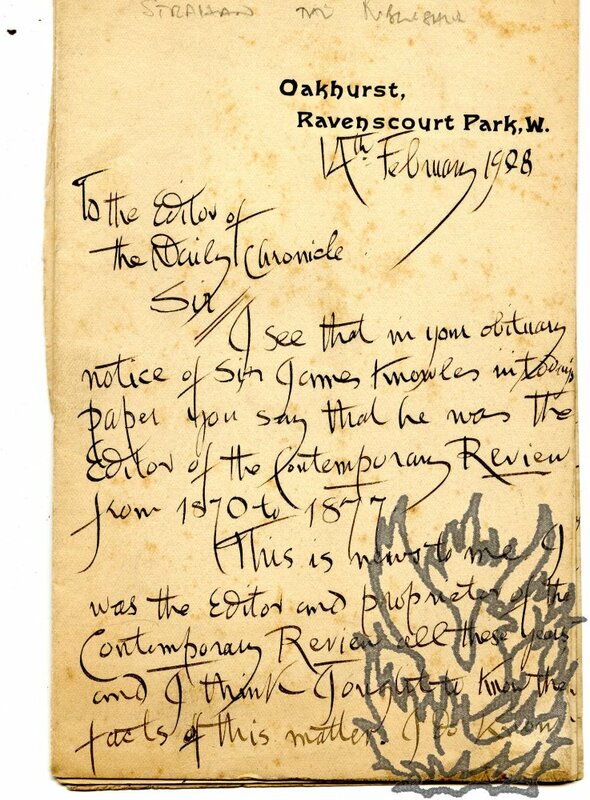 Parsons begins by informing Caswell that he is sending him a copy of the Examiner containing his article on 'Tennyson's Literary Career': 'It was sent to the Editor only a few days after the poet's death when I knew nothing about the title or contents of the new book of poems.' 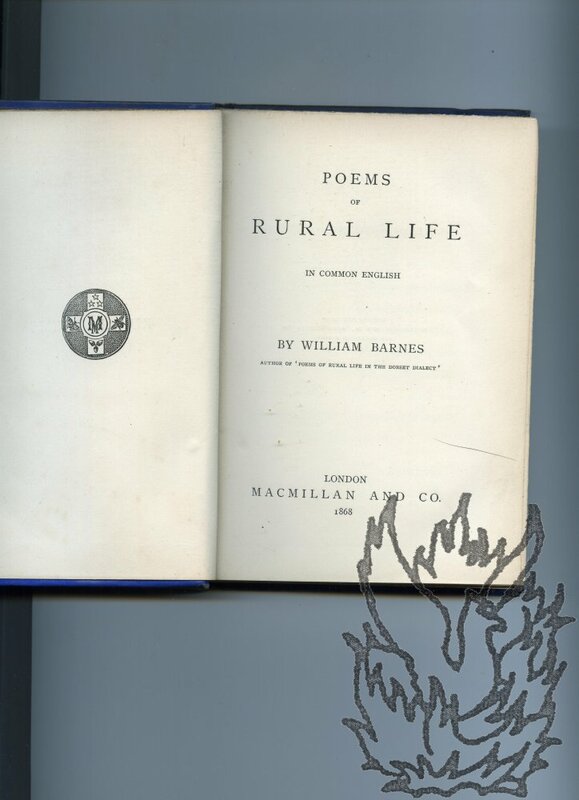 He discusses his plans to insert the article when he republishes his pamphlet (Parsons' 'Tennyson's Life and Poetry' appeared in 1892, with a revised edition the following year). 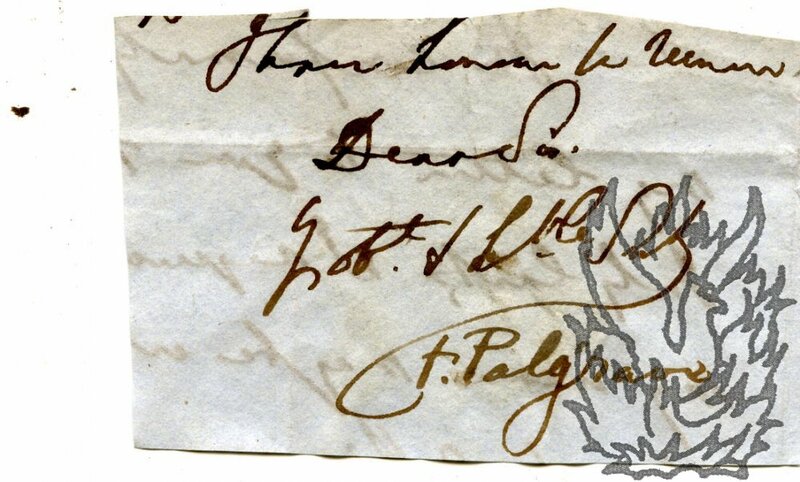 Autograph Letter Signed ('De Tabley') from the poet John Byrne Leicester Warren, Baron De Tabley [Lord De Tabley], to Mrs Kate A. Wright of Birmingham, giving her permission to include five of his poems in an anthology. 62 Elm Park Rd, Chelsea. 20 June 1893. 1p., 12mo. 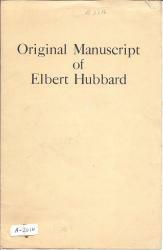 Fair, on lightly-aged paper. In envelope addressed by De Tabley to 'Mrs. Kate. A. Wright. | Monona House | Small Heath | Birmingham.' In reply to her letter of 18 June, he states that he will have pleasure in permitting her to 'insert the five pieces' which she enumerates in her 'forthcoming Collection of Poems and Ballads of the Nineteenth Century'. Kate A. Wright's 'Dainty Poems of the Nineteenth Century' was published in Birmingham in 1895. 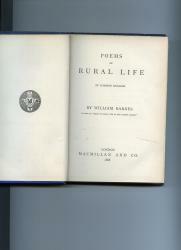 The titles of the five poems are given in another contemporary hand [Mrs Wright's?] on the reverse of the second leaf. 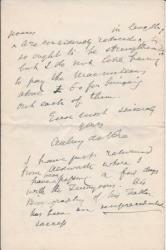 Autograph Note, Third Person, Charles D'Eyncourt , Tennyson's uncle, to the G.P.O., giving forwarding address. Two pages, 12mo, bifoliate, section (presumed postal history or blank) from second leaf. Addressed to General Post Office, countersigned D'Eyncourt. Text of note: Mr. d'Eyncourt will be obliged to the officers of the G.P.O. 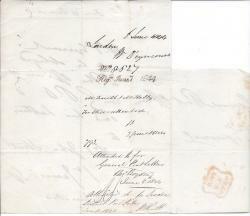 to send his Letters to | No.1 John Street St James's Sqre | 6 June 1844. From 48 Dover Street in different hand at top of page. Verso of note is stamped No. Regd. June 7 1844 with notes by various employees of the GPO who were putting the request into effect. Autograph Letter Signed to unnamed correspondent on medical matters, including vaccination. Henry Hallam, Historian, Friend of Tennyson. 67 Wimpole Street, March 19 [pencil note suggests 1857]. Three pages, 8vo, some damage, but text clear and complete, tear at fold of bifolium despite attempt to repair with sellotape., He has been asked by a friend to get an answer about the diseases of camels, quoting his enquiry in which one, Photoshootui (if I read the word right), is described, and referring to ancient sources and Native opinion. His correspondent is engaged in a popular treatise, or history, of vaccination. Hallam hopes for references to Western books that might give information. Autograph draft of letter to the Editor of the Daily Chronicle, rebutting in strong terms the claim that Knowles was editor of the Contemporary Review. 14 February 1908; on letterhead of Oakhurst, Ravenscourt Park, W.
12mo (17.5 x 11 cm): 5 pp. On two bifolium letterheads and half of a third. The text of each page is clear and complete on aged and lightly-spotted paper, but gaps between the various sections indicate that the draft is incomplete. Begins 'Sir | I see that in your obituary notice of Sir James Knowles inn today's paper you say that he was the Editor of the Contemporary Review from 1870 to 1877. | This is news to me. I was the Editor and proprietor of the Contemporary Review all these years, and I think I ought to know the facts of the matter. Autograph Signature ('F. Palgrave') on fragment of letter. Sir Francis Palgrave (1788-1861) [born Francis Ephraim Cohen], English historian and antiquary, best-known for his poetry anthology 'The Golden Treasury'. On piece of grey wove paper cut into a rough rectangle, 5 x 8 cm. Good, but with light traces of glue from previous mounting on reverse. Reads '<...> | I have honour to remain | Dear Sir | Yr obt. & hble. Servt | F. Palgrave', with the flourish to the 't' of 'Servt' forming the top horizontal stroke to the 'F.' 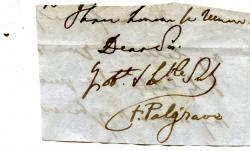 in Palgrave's signature. Reverse reads '<...> | In conformity <...> | my letter to you <...> | July last, I requir<...> | my name may be <...>'. Autograph Letter Signed "F. Tennyson Jesse" to unnamed female correspondent. One page, octavo. Good, on lightly rucked paper, with one line a little blurred by damp. She would have replied sooner to her correspondent's 'courtesy in enclosing a stamped envelope', but feels sure she will forgive her when she tells her that she has 'been in constant attendance at a hospital owing to my Father having met with an accident. I can't think what good my autograph will do anyone, but still -'. Autograph Letter Signed ('J. Ashby-Sterry') to 'Mary H. Tennyson' [pseudonym of Mary H. Folkard], 6 Saint George's Square, Regent's Park, N.W. 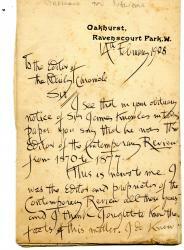 17 June 1904; on letterhead 8 Saint Martin's Place, Trafalgar Square, W.C. [London]. Two pages, 16mo. Very good. Twenty-two lines, attractively written in purple ink beneath a letterhead printed in bright red. With postmarked envelope, addressed in autograph and carrying a penny stamp. He thanks her for sending him a copy of her book 'The Luck of John Seaton'. 'It reached me down in the country where, strange to say, I was already half way through it. I bought it at the railway station & had not arrived at the name of the author, when I received your letter. 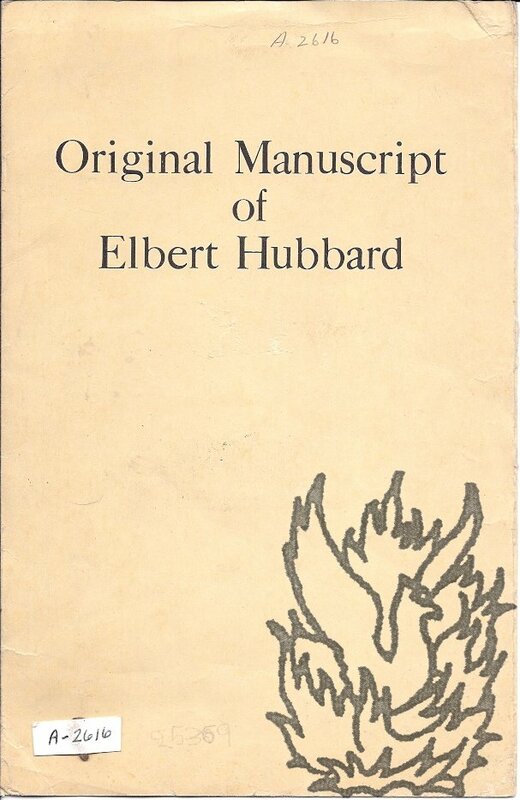 They ought to always put the name on the cover.' He enjoyed the story 'from beginning to end'. Autograph Letter Signed to 'Mrs. Samuel'. One page, 12mo. Good, if a little aged and lightly creased. He apologises for the delay in 'sending the drawing that now I ask you to please me by accepting' (not present). He asks her to accept it as a present for 'that almost superannuated festivity' of Christmas. 'I send you a coat-of-arms as that includes a certain amount of letterpress which you will I think prefer to a simple drawing'. 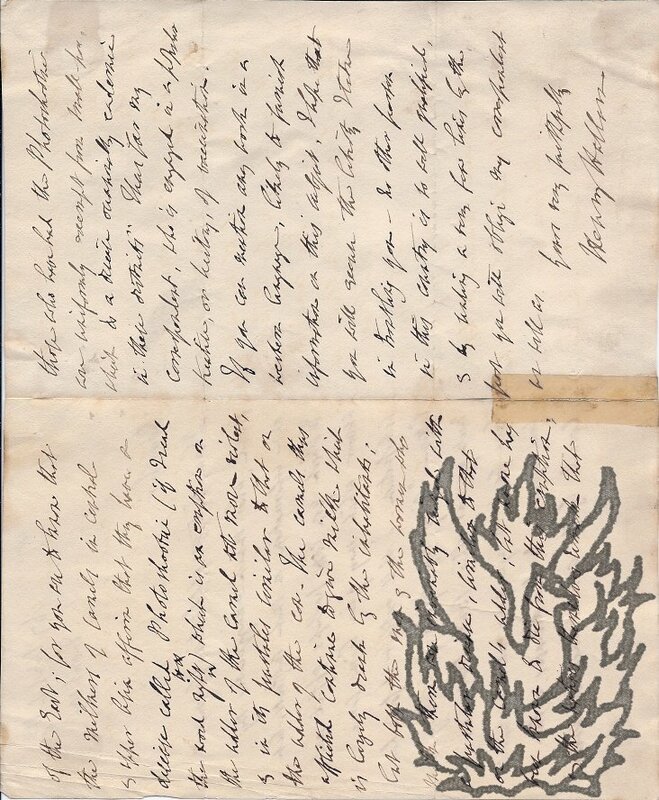 He has delivered all the drawings bought by Mrs Samuel's friend and has received his thanks.' Signed 'E. T. Rees'.